Why not consider a cooking class as the perfect gift for the special people in your life? 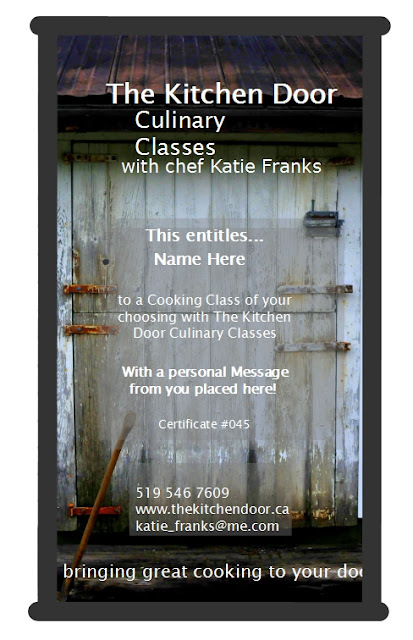 All of our classes include hands on learning, instruction by chef Katie Franks, a delicious meal we make together and a recipe book full of fun to take home at the end. Great as a gift for individuals or groups and especially anyone who loves to cook and eat in good company. Gift Certificates can be purchased online and customized just the way you like. Cost is $60 per person (no tax). See our Registration Page for easy PayPal payments or send an email to katie_franks@me.com to order. For online orders please leave the name of the recipient and a brief message in the notes section.